When it comes to car insurance, there are a number of add-on options available that can be availed during buying or renewing the car policy. Some of them are NCB retention cover, Personal Accident cover, consumable cover, engine cover and so on. One such cover among them is Zero Depreciation cover. It is also called as Nil Depreciation or simply also referred to as ‘Nil-dep’ cover. Let us find out more about it. The process of losing the value of a car in terms of money over a period of time due to factors such as age, wear and tear etc is commonly known as depreciation. At the time of filing a claim, people end up paying a large sum of the overall cost due to depreciation deduction. A zero depreciation cover comes to the rescue in situations like these. It provides a comprehensive coverage without factoring in for depreciation. For instance, if your car was involved in an accident and eventually suffered damages due to the collision, your insurance provider will cover the entire cost of the losses incurred when you file a claim. 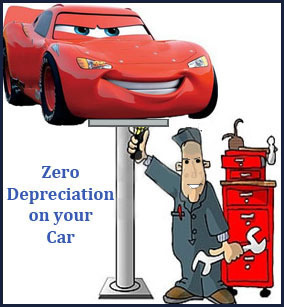 There are a number benefits for availing zero depreciation cover with your car insurance policy. This cover provides enhanced financial protection which is otherwise not there in regular vehicle insurance coverage. Here a few key benefits. There is no calculation of depreciation amount during claim settlement for car parts. With a zero depreciation cover in place, your expenses come down to the minimum providing a great deal of financial security in the process. The Nil depreciation is a great add-on that provides immense value addition to the car insurance policy. You secure total peace of mind as a result of comprehensive coverage. You save yourself from a lot of financial trouble during the time of claims. Please note that having understood the benefits of a zero dep cover, you must also bear in mind that zero depreciation is an additional benefit (add-on) that can be availed by paying an extra/higher premium. The premiums are calculated based on the vehicle’s model, its age and the location you’re based out of. The zero depreciation cover is generally not a part of the standard car insurance policy. The following are a few important points to consider while opting for car insurance with zero depreciation policy. Nil Depreciation Cover is helpful to combat the depreciating value of your car. By including this add-on to your car insurance cover there is no deduction for depreciation even on the car’s parts, other than tyres and tubes. This add-on covers private cars, with a maximum of two claims in one vehicle insurance policy period. In the case of partial loss, the claim will be settled for the insured car only if it is repaired by/ at one of the authorized dealers or workshops. Compulsory Excess will be applicable as per normal practice and Voluntary Deductible will be applicable if you have opted for it. As mentioned above, you can make only a certain number of claims under the zero depreciation car insurance. This is to limit the customers from making claims for every small damage to their car.